Do you ever remember a film by where you found it? Whenever you hear the title now, you remember stumbling across a review in a weekly tabloid that’s no longer in print. Or a movie poster that was hanging in the “coming soon” frame at a cineplex that was bulldozed over in the Aughties for a fancy grocery store? Howling III takes me back to a crummy mall that didn’t attract the fancy stores of the mall up the block. Inside the brick and cinderblock no frills building for a time there was a rather non-posh videostore stuffed into an awkward retail space. On a shelf, they had Howling, Howling II and Howling III. This was a bit of a shock since the third movie hadn’t played theatrically in the area. Did i rent it? No. I didn’t need to be obligated to return to the creepy mall. Plus I hadn’t seen Howling II: Your Sister Is a Werewolf at that point. Turns out you didn’t need to watch them in sequence to enjoy them. 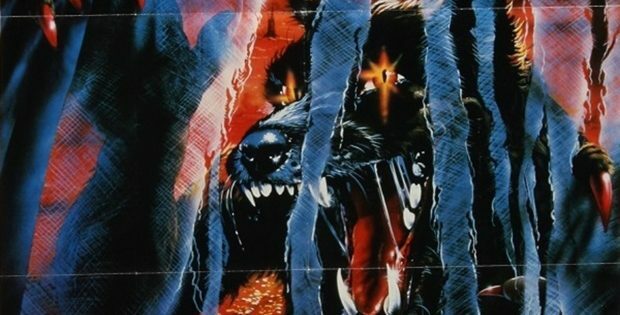 Howling III brought the lycanthropy action Down Under. A scientist (Strictly Ballroom‘s Barry Otto) shows off a film clip from 1900s of what appear to be Australian Aborigines stabbing wolfman with spears. Is this a ritual? Is this an actual event? He’s not sure. But it turns out that there’s something to it. He also shows us footage of the last Tasmanian tiger, a fierce beast that can open his jaws extra wide. The creatures were hunted to extinction around the same time to protect the sheep population. Are the two events connected? The scientist thinks so. He also points out to the president of the USA that there was a werewolf attack in Siberia. Something is happening. Back in Australia, Jerboa (Queen of the Damned‘s Imogen Annesley) has run away from her small township to Sydney. She gets lucky and hooks up with an American film company making Shapeshifters 8. The director thinks she’s got natural talent for his low budget werewolf flick. Turns out she’s got the ability to save the special effects department a fortune on transformation make up. Howling III changes up the game as it doesn’t involve any of the characters or plotlines from the first two films even though director Phillippe Mora made Howling II. He gave the film a completely Australian slant since with his shapeshifters coming from local species and not mere imported wolves. There’s a transformation scene on stage at the iconic Sydney Opera House. This film is so Australian that we get a visit from Dame Edna (Barry Humphries). Mora also adds to the mythology of the werewolf by having his breed transform if exposed to strobe lights. There’s no waiting for the full moon. This isn’t just another entry in the series meant to fill up a video shelf at a mom and pop store. This is another fine entry in the world of Ozploitation. Howling III proved to be transformative. The video is 1.85:1. The transfer brings out the over the top qualities of the film especially the film within the film. The audio is 2.0 DTS-HD Master Audio Stereo. The mix plays up the sounds of transformations. The movie is subtitled. Audio Commentary with Writer/Director Philippe Mora and moderated By filmmaker Jamie Blanks digs into how Mora made the film on his own. He made a risk and it paid off. A Conversation With Philippe Mora – An Interview With The Writer/Director (27:23) talks about coming on board for Howling II. He did it because his wife needed a car. He got to use the same crew that made Yentl. He recounts why he didn’t cast Nicole Kidman in the lead. Vintage Interviews From The Documentary Not Quite Hollywood: The Wild, Untold Story of Ozploitation! By Director Mark Hartley (18:56) has Mora talking about how he was able to fund the film with a million dollar bank loan. There’s a disturbing tale of the original baby werewolf “actor.” The effects guy talks of making werewolves on a tight budget. But he had fun figuring out ways to stretch the budget and the fur. Theatrical Trailer (2:06) promises the Howling terror is back and more terrifying. Scream Factory presents The Howling III. Directed by Philippe Mora. Screenplay by: Gary Brandner & Philippe Mora. Starring: Barry Otto, Imogen Annesley, Leigh Biolos, Ralph Cotterill and Barry Humphries. Rated: R. Running Time: 98 minutes. Released: January 15, 2019. Joe Corey is the writer and director of "Danger! Health Films" currently streaming on Night Flight and Amazon Prime. He's the author of "The Seven Secrets of Great Walmart People Greeters." This is the last how to get a job book you'll ever need. He was Associate Producer of the documentary "Moving Midway." He's worked as local crew on several reality shows including Candid Camera, American's Most Wanted, Extreme Makeover Home Edition and ESPN's Gaters. He's been featured on The Today Show and CBS's 48 Hours. Dom DeLuise once said, "Joe, you look like an axe murderer." He was in charge of research and programming at the Moving Image Archive.